284 pages | 20 B/W Illus. 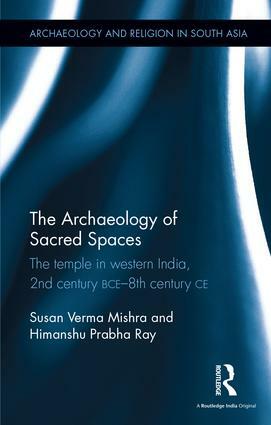 This volume focuses on the religious shrine in western India as an institution of cultural integration in the period spanning 200 BCE to 800 CE. It presents an analysis of religious architecture at multiple levels, both temporal and spatial, and distinguishes it as a ritual instrument that integrates individuals and communities into a cultural fabric. The work shows how these structures emphasise on communication with a host of audiences such as the lay worshipper, the ritual specialist, the royalty and the elite as well as the artisan and the sculptor. It also examines religious imagery, inscriptions, traditional lore and Sanskrit literature. The book will be of special interest to researchers and scholars of ancient Indian history, Hinduism, religious studies, architecture and South Asian studies. Susan Verma Mishra is Project Associate, Indira Gandhi National Centre for the Arts (IGNCA), New Delhi, India. Himanshu Prabha Ray is Chairperson, Academic Committee, Project Mausam, Indira Gandhi National Centre for the Arts, New Delhi, India. She is Honorary Professor, Distant Worlds, Munich Graduate School of Ancient Studies, Ludwig Maximilian University, Munich, Germany, and Research Fellow, Oxford Centre for Hindu Studies, Oxford, UK. This Series, in association with the Oxford Centre for Hindu Studies, reflects on the complex relationship between religion and society through new perspectives and advances in archaeology. It looks at this critical interface to provide alternative understandings of communities, beliefs, cultural systems, sacred sites, ritual practices, food habits, dietary modifications, power, and agents of political legitimisation. The books in the Series underline the importance of archaeological evidence in the production of knowledge of the past. They also emphasise that a systematic study of religion requires engagement with a diverse range of sources such as inscriptions, iconography, numismatics and architectural remains.